Last year marked a landmark birthday for The Real Mary King’s Close, and now the Edinburgh attraction has even more cause for celebration as the success of its 10th anniversary ‘Imagine…’ marketing campaign is applauded by tourism, marketing and PR industry experts. The Museum and Heritage Awards for Excellence is the latest in a recent string of awards that the five star Edinburgh attraction’s ‘Imagine…’ campaign has been shortlisted. 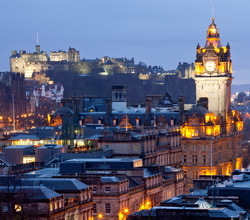 The bold new campaign, which was launched in 2013, positions the one time residents of the Close at the forefront of all promotional activity and emphasises the attraction’s historical importance to Edinburgh. As well as substantial outdoor advertising which many people will have seen on buses and taxis, the campaign extended across events, social media, marketing and PR. Added to this was the attraction’s first ever stand alone festival, Close Fest, which invited local audiences to experience the venue in a completely new light through theatre, music and comedy as well as showcasing the space which is available for private hire. The campaign which caught the imagination of the media with its creative story angles and strong news hooks was also shortlisted for a Golden Hedgehog PR Award, one of the few companies north of the Border to reach the Award finals. This campaign was part of a substantial investment in the site which included the creation of The Real Mary King’s Close tartan for staff to wear and a new state of the art interactive addition to the tour. Next PostNext Mary King’s Close…to Bursting Burger Battle!